Lloyds has accelerated its job-cutting scheme, axing a further 3,000 roles, even as it reported a 101% increase in pre-tax profits. It has also doubled its planned branch closures, with 200 more set to vanish from High Streets by the end of 2017. The bank attributed the cuts to changes in people's banking habits, and the effects of interest rates remaining low for the foreseeable future. 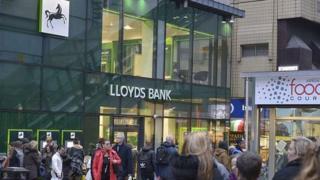 Lloyds is already carrying out 9,000 redundancies and 200 branch closures. It announced those cost-cutting measures in 2014. The bank confirmed that the decision to make further cuts was taken before the EU referendum on 23 June. The news of fresh job losses came as Lloyds reported a £2.5bn pre-tax profit for the half year to the end of June 2016. The profits rise was largely due to a sharp drop-off in payment protection insurance (PPI) compensation payouts, which dented previous profits. PPI has cost the bank more than £16bn since 2011. Lenders are expecting the scheme to be wrapped up soon. Underlying profits at Lloyds Banking Group fell by 5%, and chief executive Antonio Horta-Osorio warned that he expects a "deceleration of growth" following the UK's decision to leave the EU. But Mr Horta-Osorio emphasised that Lloyds was in a "strong position to withstand the uncertainty" created by the vote. Almost 10% of Lloyds is still owned by the British taxpayer. Lloyds shares were down 5% in afternoon trading. Laith Khalaf, analyst at Hargreaves Lansdown, said that despite Lloyds' attempt to set out its stall as a "multi-channel bank", the reality is that "demand for banking services is moving online, and so banks must follow where their customers lead, and ultimately that doesn't bode well for high street branches". He added that while the Brexit vote had hit Lloyds, "it remains a strong bank", and the impact of the vote will probably be felt most by shareholders, who may receive less cash this year. Rob MacGregor, the national officer for Unite, which represents some Lloyds staff, called the job cuts a "further body blow to the UK economy". "These are permanent jobs that are being lost," he said. "As a country, we can't afford to lose these jobs in a challenging post-Brexit world." Should we mourn 200 more lost bank branches? Do we need them when, collectively, we logged into banking apps 11 million times a day last year? "Customers love the new technology," says Anthony Browne, of the British Bankers' Association. Try telling that to millions of people who do not, or cannot, access the internet. Try telling that to the small business owner who wants to cash in money daily, but lives in one of 1,500 communities (according to campaigners) that no longer have a single bank branch. All this is being thrashed out in an independent review of an agreement aimed at minimising the impact of bank closures. There is a strong case for each side, and no easy solution.